GREAT to hear from one of the guys! Enjoyable musings by Daddy Crawford. Looking forward to February even though I will be another year older Scottsdale is my carrot, the get away that keeps me going during the scorching summers and snow bird ridden winters of the Arizona desert. Sunshine- Baseball players- feet up, smile on-watching the 3 time World Champions frolic like little kids. That is my idea of BLISS! So where was I? Oh, right. August 13. We were 4.5 games behind the Dodgers. We had lost five in a row before finally beating the White Sox. You might have seen it. 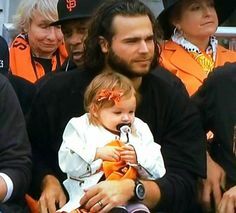 Belt, Gregor Blanco and I stopped blogging when the team was struggling so much mid-season. And then we started to win. Not that blogging had anything to do with anything. But we figured we’d just focus on winning and, well, you know the rest. Now that the season is over, and I’ve had a month to rest — sort of (more on that later) — I’m blogging again.